MATCH VENUES for the Test Match Series. has risen to an International Cricket Stadium. Galle International Stadium, the 57th International Cricket Match Venue of the World, is situated 116 Km south of Colombo in the capital of Southern Province Galle. It is one of the worlds most beautiful scenic venues. The view from the press box at the Galle International Stadium is reported as "amongst the most breathtaking in Sri Lanka". There is the glistening Indian Ocean with the rippling waters in the distance. Right across the ground, with just a road to separate the two is the imposing a 200-year-old UNESCO protected Dutch Fort. Built in 1802 by the Dutch, the Fort gives the Stadium an air of tradition and sobriety. Where the Fort ends, the jagged rocky coastline begins. The sea provides a cooling breeze across the ground. 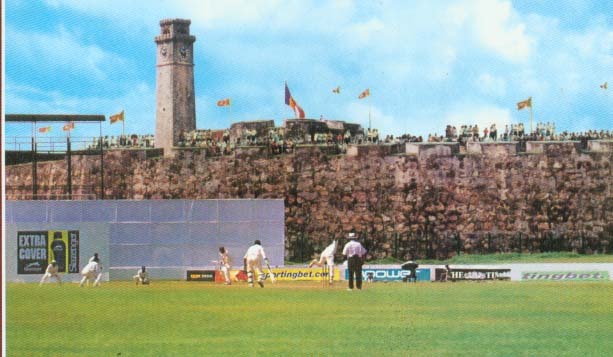 From a small beginnings as a venue for horse racing and leisure cricket, the two popular recreations then amongst the British administrators and Military and Navy personnel, European Community and also a very small section of the local community, "The Esplanade" at Galle has risen to an International Cricket Stadium. The sea-water course which gave protection to the Dutch Fort and joined the sea at its western and southern ends, was filled-up by the British and first turned into a grassy open-space field for recreation in Galle. Prior to 1998 when the inaugural test match was played here, it used to be called "the Galle Esplanade", a common area for the town where football - a popular sport in the town - was played. Celebrating its 127th anniversary this year, they are the fourth oldest Cricket Club on record of Sri Lanka and are the owners of Galle International Stadium. 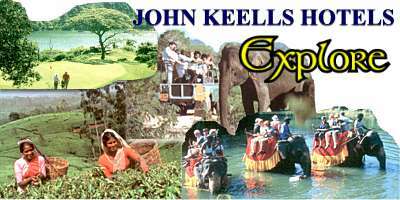 It has its recorded history from 1874 when (then) Ceylon was under the colonial administration of the British. This mention is in connection with a match all Europeans played under Galle Cricket Club against an all-Burger team, "all-Blues" in October 1874. Clubs main concern and plans since 1876 were to better-organise the then Cricket in the area into a more acceptable form and then popularise it as a disciplined and healthy game especially amongst the youth in and around Galle. George Vanderspar, a Cricketer himself, is still fondly remembered for his great contribution in the administration of the Club in its infancy period of 1876 1900. This was also the era that saw not only the active participation of Galle Cricket Club in tournaments with all the other reputed Cricket Clubs, mainly from Colombo, but also in winning ways over the much fancied opponents. In the 1920 decade had even seen a lad of Galle CC by the name of A. Hettiarachchi, being selected to play for the "Ceylonese XI". D. D. Jayasinha (1937) is the first player from Galle on official records, to gain entry to a National team. In the 1950 decade Galle CC collected funds and put up its own pavilion. In 1963 they became the Division -3 Cricket Champions bagging the Daily News Trophy. By virtue of being the Division-2 runner-up in 1975 for the Donovan Andree Trophy, they qualified as a Division 1 Cricket Club from 1976, and soon thereafter got turf pitches due to the efforts of the then President Edgar A. Wijesuriya with a grant of Sri Lankan Rupees 40,000. This generated more interest in the game there and even led to the formation of the Southern Province Cricket Association in July the same year itself. Hon. W. Dahanayake, a former Prime Minister (1958-60) and member of the parliament for nearly 40 years was an ardent cricket fan later in life. As a young man when the blood was hot, "W" as he was popularly known, was a rebel against its establishment here. 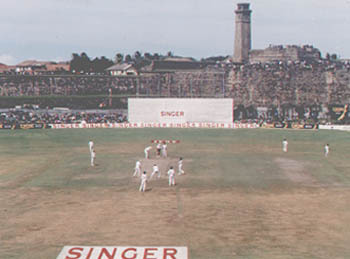 The first 3-day match at Galle on the Esplanade was against New Zealand in 1984 and 'Daha' was a distinguished invitee. In 1985 he was elected President of the Galle District Cricket Association, a post he held up to 1988. As an ardent supporter of Cricket, in 1990 he helped to develop the infra-structure at Galle Esplanade to hold Test Matches with the assistance of Hon. Gamini Dissanayake, the President of Sri Lanka Cricket Board then. UNSUNG HERO OF GALLE CRICKET. No worthwhile writing concerning "Galle Cricket" can ever be done without reference to E. M. Karunaratne. Although dead and gone and long forgotten as well, he is known as the real backbone of Galle Cricket Club for many decades. He was a highly successful lawyer by profession with a winsome manner of speech and above all with cricketing philanthropy that is said knew no bounds. It was this disarming lawyer and a genial gentleman who shouldered the cricket burden of Galle 'single-handed' from 1920 to 1952! It was his larger role as administrator and benefactor, along with his leadership, in matter and manner, more than as a player is where he really earned his name and made his mark. Popularly known as 'EMK', Edwin Mendis Karunaratne born on 27th February 1886, studied, played cricket and then taught at the then prestige school in town Richmond College. He was so good at Cricket that whilst studying at the Law College in Colombo he played for the SSC and thereafter went on to play cricket for Galle CC, captaining them for 25 long years,(1922 1945) and then again in 1948. In 1933-34, he was the President of the 'Ceylon Cricket Association'. From time to time until 1965, he was also the President or the Secretary or the Treasurer of the Club. Endowed with a thriving legal practice, he bore the brunt of the clubs expenses virtually single handed in those hard-pressed days and even had found employment for many a promising cricketer from Galle. It was also the period during which he got many an overseas team that included internationally know cricketers such as Mankad, Amaranath, Naidu and Merchant to play Cricket in Galle. 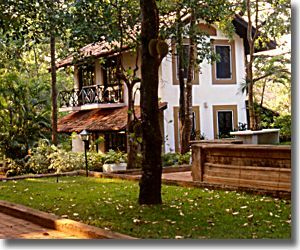 It is recorded that 'EMK' hosted many of Bill Woodfull's Australians in 1934, when their ship en-route to England berthed in Colombo and taken all the way to Galle in cars. Because of his devotion and love for Cricket, he even spent lavishly out of his own purse on most of these occasions and at other times got the support of the Galle Gymkhana Club, a thriving sporting and social club there then. But for 'EMK', cricket in the South of Sri Lanka would not have prospered to the extent it did. Until his death on 19th December 1976, "EMK was Galle Cricket and Cricket in Galle was EMK". Getting Down to the Cricket. The venue had its first first-class match in 1984 and its inaugural Test match in 1997 / 98 when Sri Lanka took on New Zealand in the Second Test. The pitch has improved under the stewardship of the curator Jayanada Warnaweera, a former Sri Lanka off-spinner. Nevertheless, its known to favour the spinners and Sri Lanka have an excellent record having won seven of the nine Tests played there. Three out of the current top order - Marvan Atapattu, Mahela Jayawardene and Kumar Sangakkara - average over 80 at the venue. Muttiah Muralitharan became the youngest and the quickest to the 400 wicket-mark here against Zimbabwe in January 2002. The pitch at Galle is generally a hard flat batting track. The proximity to the seashore gives the air a bit of a nip, giving the pacies something to look forward to in the first half an hour or so. The grass on the field is an even carpet, not thick enough to slow the ball down significantly, but certainly enough to keep the ball from getting scuffed up too early. Lesser Known Records at the Venue. Probably a world record in minor cricket was established at Galle Esplanade in February 1950 when W. B. Bennett the wicket-keeper of the Galle CC playing against Mahinda College was involved in the dismissal of all ten batsmen. The most powerful boundary-six in the cricket history of this match venue had come from J.W.Erskine batting from the "pavilion end" with a hit that saw the ball spear-heading over the sightscreen and bounce-off the ramparts. Incidentally he holds hold the record of scoring the first recorded century on this ground in 1986 against Royal Dublin Fuisters, another leading Cricket Club then from Colombo. Percy Mack in one of his 'hits' from the "clock-tower end" made the ball pass well over the boundary line to reach the then Police Superintendent's residence. AS AT 01st December 2003. Sri Lanka vs New Zealand (2nd Test) 9 -13 March 1998. Result: Sri Lanka won by an Innings and 16 runs. Sri Lanka: First Innings 323 /10. New Zealand: First Innings 193 /10. Test Match with each of the 8 other Test-nations here. In fact Murali has taken 5 wickets or more on 7 innings here. (E): Darren Gough 95 / 1 / 26 Ov. vs SL (1st) Feb. 2001. (G) / (S): M. Muralitharan 171 / 13 / 76.0 Ov. vs. SA. July 2000. -- -- M. Muralitharan 170 / 11 / 85.1 Ov. vs WI. Nov. 2001. See the BIG Difference hereafter !